I am seriously in love with happy, fun races. I am especially LOVING races that I can do with my kids and friends. When I saw the Color Run advertised for Portland, Maine earlier this spring, I really wanted to do it. But I knew my race schedule was already packed for July, so I didn't. After reading about some many bloggers experiences doing this race, I now regret it. And nobody wants to regret not doing a race, ever! I really wish the Color Run was coming back to Maine soon, but I guess I am going to have to wait until next July! I'm a patient girl (sometimes). 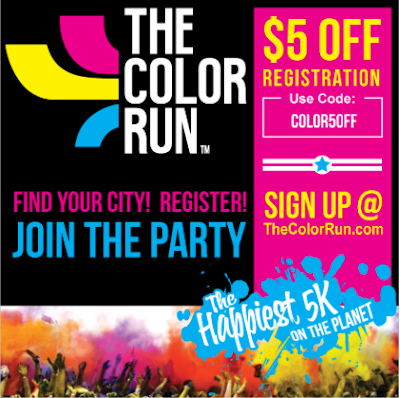 Why wouldn't I want to do the Happiest 5k on the Planet? This unique paint race celebrates healthiness, happiness, individuality, and giving back to the community. The Color Run is not about your fastest 5k. It's an untimed run that focuses on the fun. Then when you get to the finish line, there's a gigantic "Color Festival" using more colored powder to create even more happiness and more lasting memories. Oh, and more vivid color combinations. There's really only two rules with this race - Wear White at the starting line and finish plastered in color! Very simple rules and easy to follow. One great thing about registering a team of 4 or more people, the price is automatically $5 cheaper. If you use the promo code - COLOR5OFF - on top of that, you save $10! Important to remember - the promo code does not guarantee a spot in a race! If you see a race close to you that is still open register quickly! The code is only good for a city that is not sold out. Need to see a list of cities? Having done a few fun races lately, I definitely recommend having a team. Whether your team is your family, group of friends, coworkers, random people on the street. It's still more fun to be with a group of people! If you register as a team, you get to pick a groovy custom team name. Then you get to run/walk together and "help" each other get really colored up over the 5 color kilometers. Yes! I am an Ambassador for FUN! For more information about the Color Run - check out their about page and the FAQ page. 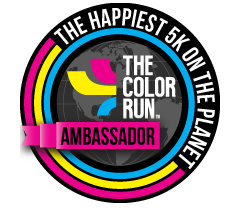 Disclaimer: As a Color Run Ambassador, I will receive two entries to a race. I am not required to give positive review. As always, all opinions on my blog are 100% my own. I just ran this one in Savannah, it was perfect for my first ever 5k! There's no pressure and everyone has such an amazing time!